Mylan has finalised an agreement to pay the US government $465 million, resolving a case accusing the pharma company of overcharging for its EpiPen anti-allergy pen. EpiPens provide a potentially life-saving shot of epinephrine for people who have had an anaphylactic shock. The announcement confirms a deal originally struck back in October, where Mylan agreed to reclassify the device so that US government agencies can purchase it at a lower cost. Mylan had supplied the EpiPens to the US government’s Medicaid healthcare programme for low-income people – but the US Department of Justice had claimed that the pharma had overcharged for it. The case revolved around whether EpiPens were properly classified with the Centers for Medicare and Medicaid Services as a “non-innovator” drug, which affected rebate calculations. EpiPen had been classified as non-innovator drug before Mylan acquired it in 2007 based on longstanding written guidance from the Federal government, the company said. The new agreement means EpiPen will be classified as an “innovator” drug, meaning Mylan will have to give a higher rebate back to the government. Mylan said the settlement provides for resolution of all potential Medicaid rebate liability claims by the federal government, as well as potential claims by certain hospitals and other institutions. It allocates money to the Medicaid programmes of all 50 states and establishes a framework for resolving all potential state Medicaid rebate liability claims within 60 days. Mylan has also entered into an agreement with the Office of Inspector General of the Department of Health and Human Services. The settlement does not contain an admission or finding of wrongdoing and Mylan will reclassify EpiPen Auto-Injector for purposes of the Medicaid Drug Rebate Program and pay the rebate applicable to innovator products effective as of April 1, 2017. The active ingredient in EpiPens has long been generic, but their high price last year drew the attention of US authorities as part of a broader discussion about drug prices. 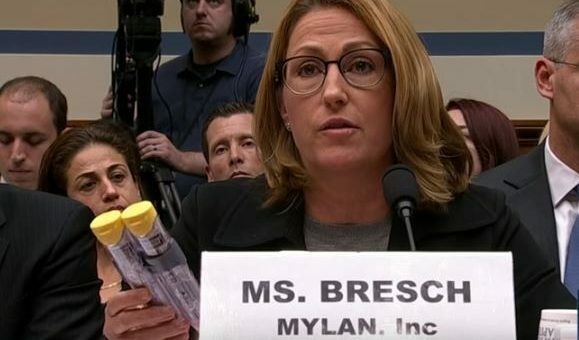 CEO Heather Bresch (pictured above) last year appeared before the House Committee on Oversight and Government Reform to defend the $600 price for a pack of two EpiPens. She said Mylan receives around $100 for a pack of two pens, with the rest covering middle-men and manufacturing costs. Following criticism of its pricing of EpiPen, Mylan has launched an identical, but cheaper, authorised generic version.